These are original Filter'Tron sized using only the finest parts and materials available. Our covers and magnets were reverse engineered from an original 1960 vintage Filter'Tron pickup and they consist of the same materials and composition. With our consistent and proprietary winding technique we were able to unlock the true potential of the Filter'Tron pickup tone so that it blooms with enhanced touch sensitivity and clarity. If you are looking for the jangle, growl, bite, or twang of a vintage Filter'Tron pickup, then our Classic Mojo'Tron is a very versatile choice. - Higher output bridge position for more output and better balance between neck and bridge positions. - 4 conductor leads for coil tapping and series parallel wiring options. zZounds is an authorized dealer of Mojotone products. 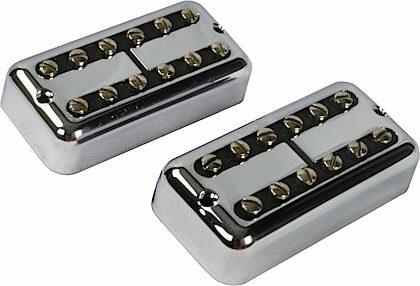 - (Set of 2) MojoTron Pickups neck and bridge.